massive car vibration started, visual diagnosis was broken / collapsed drivers' side motor mount. picked up replacement mount (autozone, duralast brand - i know it won't last long but it's enough for now) and installed. upon lowering the engine, the drivers' side mount is now more or less squished way down unlike the passenger side. is this an issue? is it normal for there to be a variation? vibration is gone now so it seems to be doing its job. also i discovered that the bolts that hold the engine to the mounts were totally absent, can anyone tell me what the specs on those are so I can order up a replacement from the bolt supply? I have heard folks have trouble with the motor mounts, and some fill em up with something(silicon/rubber/etc.) to make them more solid. I do know that if the bolts are missing that would certainly make some rumble. I would take care of this first. The only reliable suppliers for motorounts are Lemforder and Phoenix. 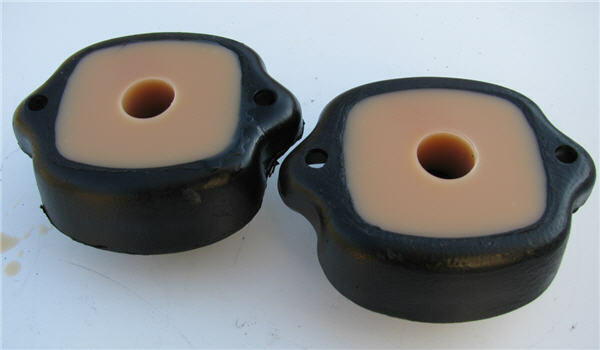 They are the same part, from the OE manufacturer. All the rest are varying degrees of junk. The driver side mount usually wears a bit quicker. I figure your cheao ount will be OK for now but you may find its shot within 12 months or sooner (based in accounts on this forum). Some people full theirmounts with shore 30 urethane to enhance the strength. just read up on both the shore 30 and the brands. having trouble finding phoenix / lemforder mounts that are listed at compatible for my '81 240d, is there a way to confirm compatibility of other mounts? i.e. pelican has phoenix mounts but only for 82-85 300D/300CD and 81-85 300TD. i'd hate to find out they don't work when i'm fumbling around the engine bay trying to bolt things up. also only info i can find for bolts are 8mm hex, length seems crucial though so this figure would be helpful if anyone has it. don't have any bolts in place currently so waiting a week for something to ship in would be less than favorable, especial during the holidays. The specs are M10x1.5 - 40mm length for the single large bolt that goes through the center and M8x1.25 - at least 20mm length for the two small ones that hold the mount to the frame. I'd go for some blue thread lock. EDIT: Forgot to add that both bolts are socket cap style (screws, technically). I tried filling my mounts like that. The result was that more vibration came through. It is even worse if you fill the transmission mount. I have also found that winter's colder ambient temperatures affect the OEM rubber mounts making them harder... thus I get more engine vibration on cold mornings. The car smooths out quite a bit as the engine bay warms up. I believe the turbodiesel mounts will work, but best idea would be for you to ask that specific question in a new forum post, so the 240d crowd can chime in. You may not get an answer if it's buried in this thread. Lemforder Mounts are not expensive and are the same as you get from the Mercedes Dealer. They work well for most people. But, you also need to fix any issues with the Engine that can cause excess vibration. I wonder if you filled them with too hard a material. Mine are fine down to 20F...maybe more, just haven't had it any colder. My first shot at filling was with a Shore 70 urethane and it rattled like a solid mount. I did a quick test with un filled mounts and it was very smooth. Then filled those mounts with Shore 30 urethane and it was indistinguishable from stock. It's been nearly 100k miles and no sign of collapse. ...just a data point for consideration. I concur w/ post #7 that the bolts are 10 mm, 1.5 mm pitch (coarse). I know because I just re-threaded the stud of a hydraulic mount to screw into the aluminum engine bracket. The tapped hole in the bracket is at least 30 mm deep. Of course, you need an allen-head bolt and it needs to be longer for the bracket's hole, so 40 mmL sounds correct. Haven't tried the hydraulic mount yet. I found that some current diesels come w/ hydraulic mounts, so might work good. They are not known for longevity in the few cars they have been used in. Indeed, one Jap car went back to solid rubber after many failures. If it does work, I might sell kits for others. By "work", I mean that I will barely hear the engine at highway speeds, which is what these semi-luxury cars should drive like. I never owned one new, so can't say, but imagine they must have been much smoother. The cheap India rubber mounts I have tried do squash down too much after a year. I filled some w/ PL1 polyurethane caulk, as have many others (Google Images). That stops the squashing, but puts the weight on the thin sheet-metal under the mount which cracked it in my 1984. I welded in a backing plate to fix that, but seems the car is more "buzzy" on the highway. The hood vibrates visibly in spots at idle, but might have been true before. Mach 4 where do you purchase the shore 30 urethane at? Use Of Flexane Urethane. Flexane (spelling) Urethane comes in different shore ratings and is normally used to make molds. There are sorces of Urethane in things like in a tube sealants as are used on Homes but you would need to go to the makers website to see what shore spec it drys to. McMasters Karr, Granger similar companies sell it but you can look on the internet at Amazon and eBay. There is likely similar products made by other companies. When the owner found out the cost of new shock mounts, they elected to (emergency repair) try Polyurethane Construction Adhesive "Liquid Nails" – No. LN-950. I get mine at Reynolds Advanced Materials (Reynolds Advanced Materials | Everything for Mold Making & Casting), but a Google search for polyurethane casting resin will turn up lots of sources. The critical parameter is Shore A 30.